Product Features: --- 7inch HD Resolution: 7-inch full-angle high-definition LCD screen, 1080P HD picture quality, restore the real image. --- Real 1080P HD Video: Record HD Video in 1080P mode. The Wide Angle front camera lens, can capture all the action in crystal clear HD video. Video and audio are automatically recorded in an endless loop and saved in memory card. Record traffic incidents, scenic travel, unexpected moments or any social media worthy video. --- 6 Glass Professional Camera: using wide-angle infrared filter glass imports 6 glass lens, high temperature does not change color, advanced deformity correction technology, greatly reducing the bending of the image, so that quality is more perfect. Front Lens:170 degree A+ grade high-resolution wide angle. Rear Lens:120 degree A+ grade high-resolution wide angle. 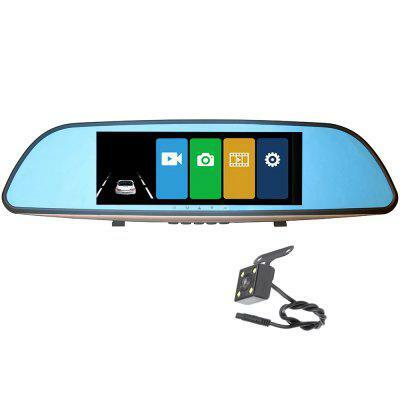 --- Reverse Image and PIP Display Mode: This Car DVR has two cameras that allows for simultaneously recording videos from two different angles. Picture in Picture display will let you have clear view from front and back-up camera . When the car in Reversing Gear, this car dvr will automatically switch to the back-up camera image view with parking line. --- Motion Detection, Parking Monitoring Support: When the camera front object is stationary, the DVR will stop recording, When the camera detects an object movement, the DVR will automatically record the video. --- Loop Recording Support: When the TF card is full,it will autiomatically delete,the former video and keep recording all the time. --- Night Vision Function: Fill in light to allow you to make clear recordings in relatively dark environments. Want to be notified when the ZIQIAO XR701 Full HD 1080P 7 inch IPS Night Vision DVR Rearview Camera gets even cheaper? Make sure you snag the best price by entering your email below. We'll email you when the price drops, free! We're tracking the price of the ZIQIAO XR701 Full HD 1080P 7 inch IPS Night Vision DVR Rearview Camera every day so you know if that deal is really a steal! Check back for to check the best price for this product - and whether its current sale price is really the cheapest it's been! No ZIQIAO XR701 Full HD 1080P 7 inch IPS Night Vision DVR Rearview Camera coupons found!